I have never had a desire to get a tablet, even when Apple introduced their iPad earlier this year. Lately, I got a Kindle for my e-reading needs. It had all I need for reading purposes except that when it comes to reading magazine, it becomes dull and boring. So when the news of 7″-sized Creative ZiiO and Samsung Galaxy Tab were released, I began to evaluate them with earnest, hoping to find one that could supplement Kindle. iPad was still out of the question because it’s supposedly “cutting-edge” size turns out to be the biggest inhibitor to be an effective e-reader. I ended up with Galaxy Tab, which is 2.7″ smaller than an iPad (thus easier to hold as an e-book) and nearly half the weight of iPad (wouldn’t feel tired even with one hand holding the Tab). I admit I am a sucker for latest (and greatest) technologies. Creative ZiiO, despite being competent as e-reader and general tablet purposes, did not win me over with their less impressive touch display. 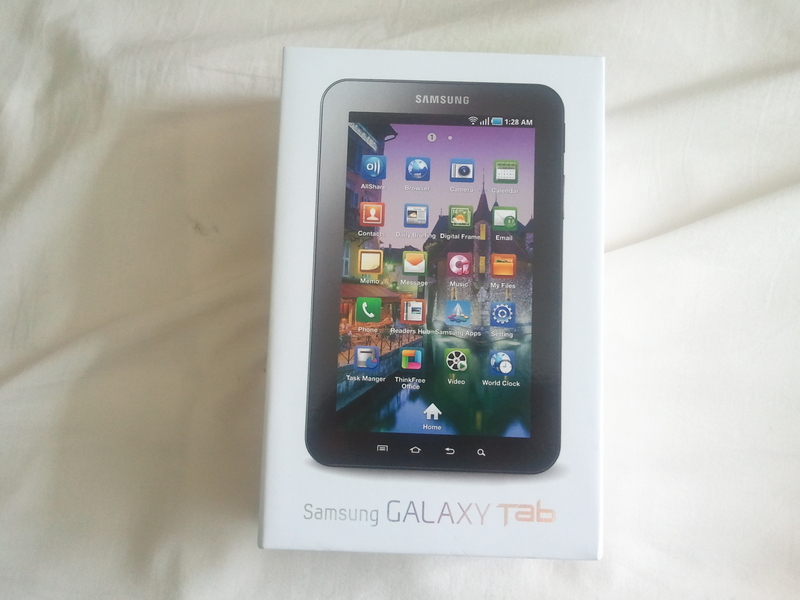 And with Samsung Galaxy Tab’s Super AMOLED display, the Tab was just calling for me. The first un-boxing impression was not as spectacular as thought, probably because I was staring at the tablet as an oversized Galaxy S smartphone that I owned before. But the tablet won me over shortly after a initial usage. The quality of the tablet exterior is top notched, and would put HTC phones to shame really (more on that later when I blog HTC Desire HD). The white piano finishing at the back housing makes one wonder why Samsung did not do the same for its little sibling (i.e. Galaxy S) which has a black “plasticky” casing. 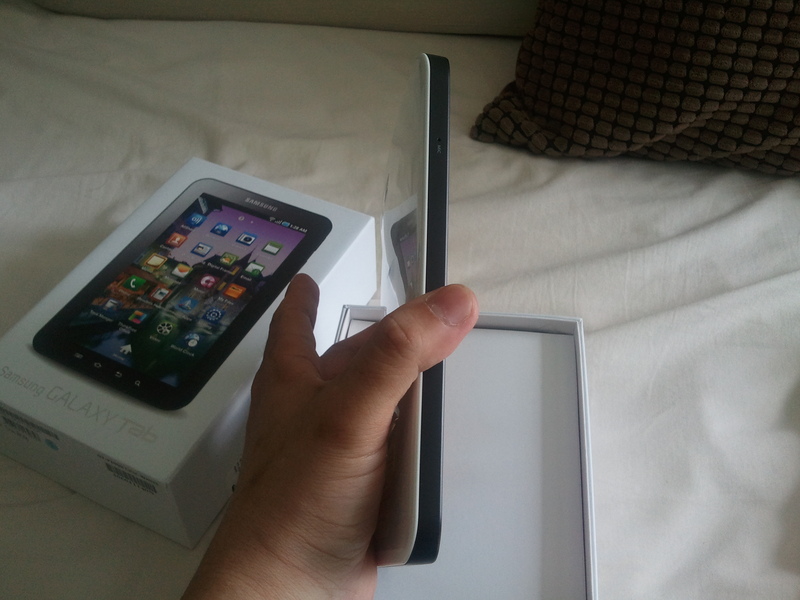 If I had to nit-pick, it will be the black trimming which breaks the seamless white tablet design. 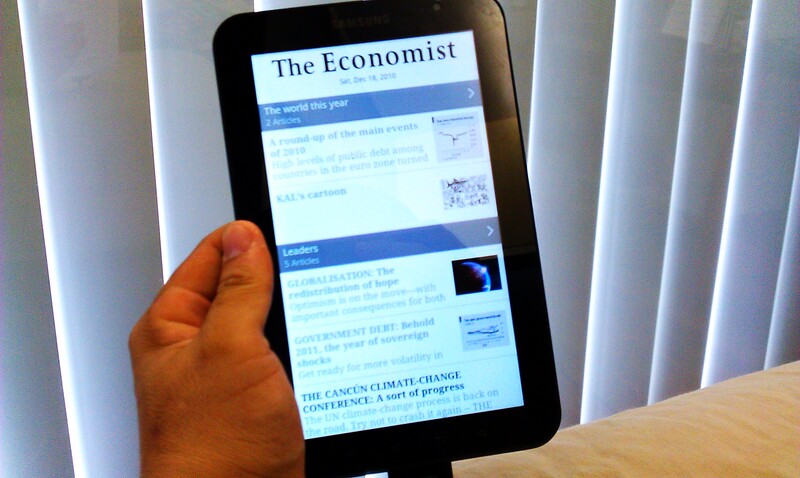 Functionally, the tablet is responsive, in contrast to some of the lag claims alleged in the net. The navigation experience is smooth and snappy, the applications are lag-free and responsive. But as with Galaxy S, I could not stand the i-Phone like home screen interface, and thus wasted no time in replacing it with Launcher Pro Plus. Even though I bought the tablet with the e-reading as the primary function, I was keen to ensure it remains competent in other aspect of tablet features, and that it is not just an expensive e-reader. Setting up google and exchange account sync was a breeze, and I could access my both personal and work emails/contacts/appointments with ease. In comparing with my “SSD enabled, 6G DDR3 super-charged, almost instant-on” HP Envy laptop or my “depending on the time of the year” smartphone, I admit using my Tab for a quick ad-hoc email read/reply has become a natural and preferred choice these days. 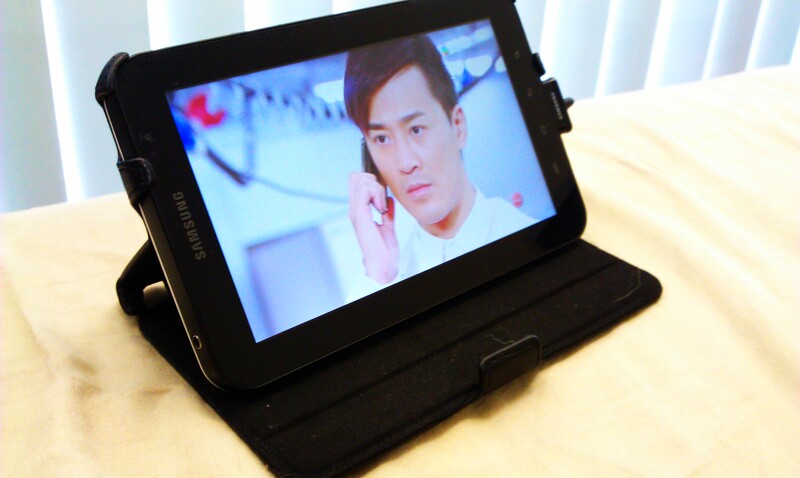 Switching gear to the entertainment aspect, the Tab serves well as a gaming machine and a media player. Apart from the ‘mindless game’ like Angry Bird or Farm Story (which is the only reason my wife would seize my Tab for) the Tab demonstrated its gaming ability in graphic intensive games such as EA Mobile’s Need for Speed and Gameloft’s Sandstorm. Perhaps a 10″ tablet would be more visually pleasing in such circumstances, but frankly, if I need a bigger screen I would have gone with my Ps3 and 46″ Samsung 3D LED Full HD TV. A 7″ tablet has indeed brought the mobile gaming experience to a new level, as games were previously played in a 2.8″ to 4.3″ screen displays. When it comes to media playing ability, the feature can and should be assessed in two folds. At the very basic, a media playing device should have hardware capable of playing most if not all HD media format, such as DivX, Xvid, AVCH. No doubt there are applications like VPlayer and RockPlayer which could play most of these formats, but you would get better quality playback with hardware decoding, especially if you are playing HD videos. Samsung, being a home entertainment specialist, just does it so well in this aspect with the Tab, something that HTC fails to deliver even with their latest flagship product. At the next level, one should look at the gadget’s media streaming capability. If playing a local HD media well is now established as a basic function, sharing HD media to/from a remote media player/server would be the advance feature you could look at. However, once you experienced it, I bet you would want to make sure your next gadget would retain such functionality. While services such as YouTube or Blinkx Beat had kick started the craze in video sharing through the internet, I still stand by my opinion that Digital Living Network Alliance (DLNA) certified devices will be the one that digitise how we would capture, stored and shared our precious moments with our loved ones. DLNA defines the standards and technologies on which consumer appliances would connect with another for the purpose of sharing musics, videos and photos. I first came across this concept more than half a decade ago, and it is only recent that it caught the general consumer awareness. Unfortunately, the AllShare app found in the Tab is buggy and less functional than that found in other Samsung devices. Fortunately, it is a software-related feature, and we can therefore find software alternatives, as long as we have the hardware-dependent basic function (i.e. media player). A quick explanation on this point; DLNA-certified devices enable one to discover or share media content with one another. Once the media content is discovered, identified for sharing/playing, it is back to the device itself to stream (possibly transcode during the process) or render (to decode the format and playback) the content in question. The former can be achieved via software, whereas the latter is best accomplished with the help of hardware. For what is worth, Apple does not support DLNA, and uses its own “Air-play” to share media in “Apple universe”. So far, I find UPnPlayer (downloadable from Android Market) the most complete software as far as DLNA feature is concerned. It is the only DLNA player that could support all type of media content (i.e. music, photo and video). The key shortcoming would be its unpolished user interface, but functionally, it is one of the best, if not the best out there. There are other good DLNA players, such as 2Player, but they would either support only 1 type of media sharing or have certain features broken. 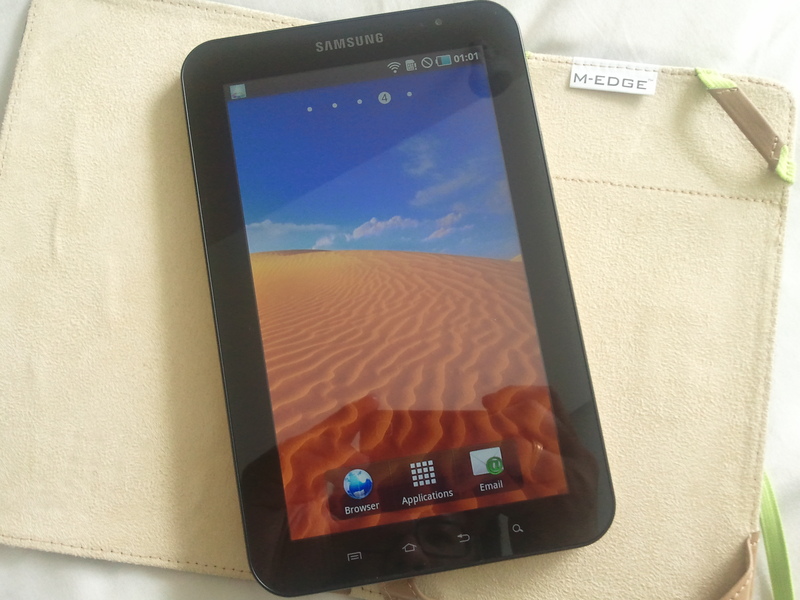 While Galaxy Tab has met or exceed most of my expectations, it is still not a perfect gadget to say the least. There are many irritants; Battery life is probably a couple of hours weaker than what an iPad can offer; Inserting or Removal of SIM card will require the tablet to reboot (probably a Android/Froyo problem) , and it is a tad too big to be used as a voice phone. While I had subscribed a new line for the Tab, and am using it as a phone with the help of bluetooth headset (in avoidance of pressing the big screen against my face during a phone call), it is still not a phone you would bring in every occasion. But as the saying goes, if there exists a perfect device, that will mark the end of the hunt for one. And when that happens, it will be a miserable day for a gadget fan like me. So I would be more than happy to let the pursuit continues!